Il Carpaccio serves a wide variety of authentic Italian cuisine, ranging from the highly regarded cuisine of Northern Italy to genuine crispy, thin-crust, Italian-style pizza. 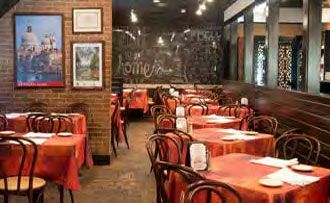 Casual, attractive restaurant, with large, attractive bar and a genuine brick oven (imported from Italy) for baking pizza. A casual restaurant, with excellent food and service. Attractive additional dining room perfect for group functions. Lunch from 11:30 a.m.-2 p.m. and dinner from 5:30 p.m. “until,” Monday-Saturday. Take-out is available.